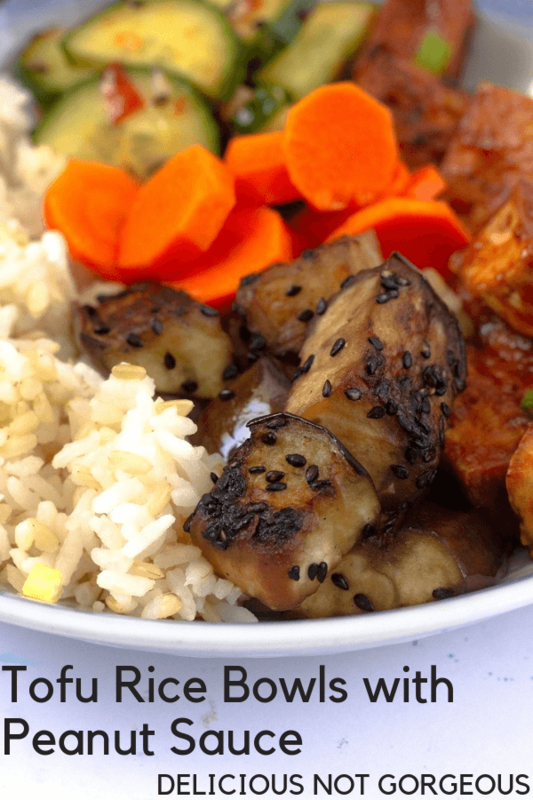 these peanut tofu rice bowls have plenty of crunchy pickles and tender, sesame-glazed eggplant to go with the addictive peanut sauced tofu and chewy rice. idk what to say besides that i’ve been living off of a steady diet of work hard, potato hard. the digital marketing world is a little bit nuts during q4, plus i’m getting added to a few new projects (one of them exciting, one of them less so lol). but did i mention that i got to see kelly clarkson on friday, or that i work from home once a week now and roll out of bed onto the couch and don’t change all day? so there’s balance. somewhere. i’ve been trying to prep lunches for the week on sundays, and these peanut tofu rice bowls were on call for a recent week. 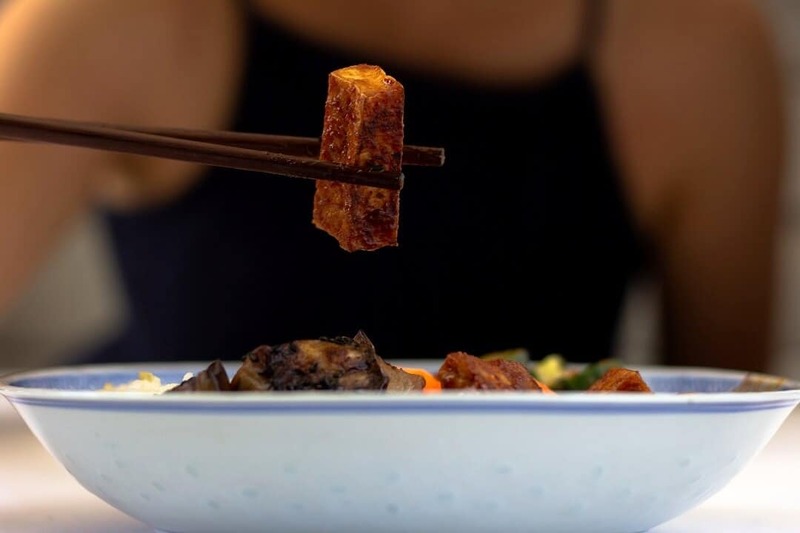 they’ve got crispy pan-fried tofu coated in garlicky peanut sauce, crunchy tangy carrot quick pickles, spicy cucumbers, silky soy-glazed tofu and chewy rice to mellow everything out. you better bet i’m the person who needs to have something to look forward to eating at lunch, and this is it. 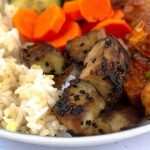 Every part of these peanut tofu rice bowls is tasty, from the sesame eggplant to the cucumber kimchi. Combine everything in a small bowl. Stir occasionally to make sure that the carrots get evenly pickled. Let sit at room temperature until you're ready to assemble the bowls. Combine everything in a small bowl. Stir occasionally to make sure that the cucumbers get evenly pickled. Let sit at room temperature until you're ready to assemble the bowls. Heat some oil in a large skillet over medium-high heat. Salt the tofu, then add the tofu in a single layer to the skillet. Cook, flipping the tofu until all sides are golden brown and crispy. Mix the sauce ingredients together in a large bowl. Add the hot tofu and toss until combined. To the still hot pan, over medium-high heat, add more oil. Add the eggplant and saute until browned on the first side, 5-10 minutes. Drizzle with the soy sauce, maple syrup and sesame seeds; sauté, stirring frequently, until browned on all sides. 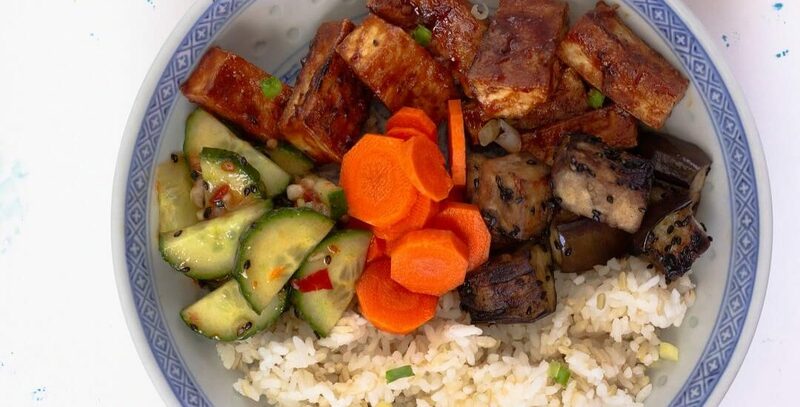 Divide the rice between serving bowls and top with the tofu and other desired toppings, such as fresh vegetables, pickles, kimchi, and/or chili garlic sauce. Adapted slightly from Minimalist Baker. That’s pretty cool that you got to see Kelly Clarkson, but even cooler that you can roll out of bed and work from home once a week! 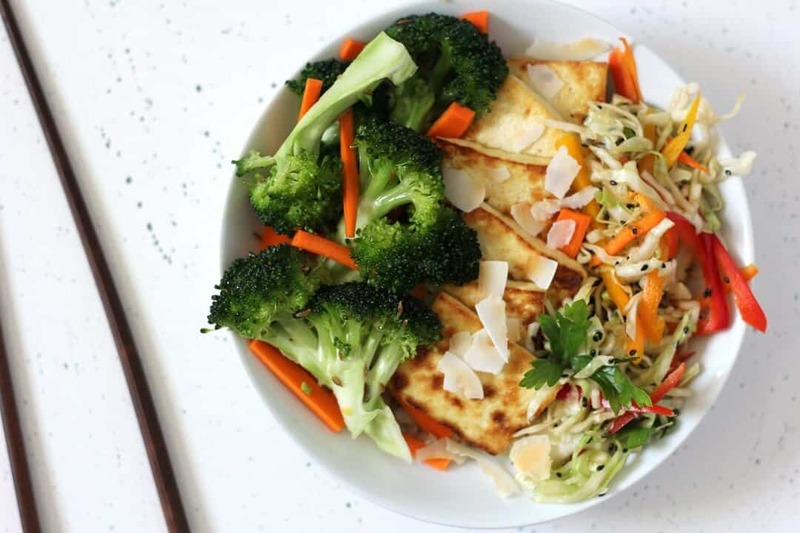 This recipe looks perfect for meal prep! Happy Monday Heather! ahh yes kelly clarkson is good live every time i see her (she was one of the few artists who sang live for the macy’s thanksgiving day parade, and even in all that cold early in the morning, she sounded so good). This is fabulous. And what you’re doing, more prep, is just smart. Plus it saves money. Pickles, kimchi, peanut sauce – all of my favorites in here, Heather! I love this type of bowl. I could eat it every day, too! 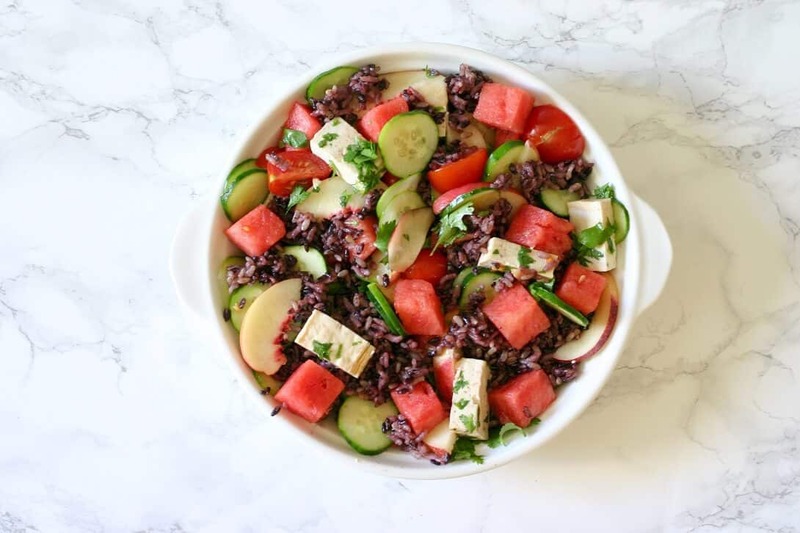 I am so jealous that you get to work from home once a week 🙂 And this tofu bowl looks amazing…so many layers of flavor! Kelly Clarkson and working at home one day a week! That is great! I love pan-fried tofu. This rice bowl is right up my alley! I can eat it for lunch and not get tired of it. Sounds wonderful!! So much yumminess!